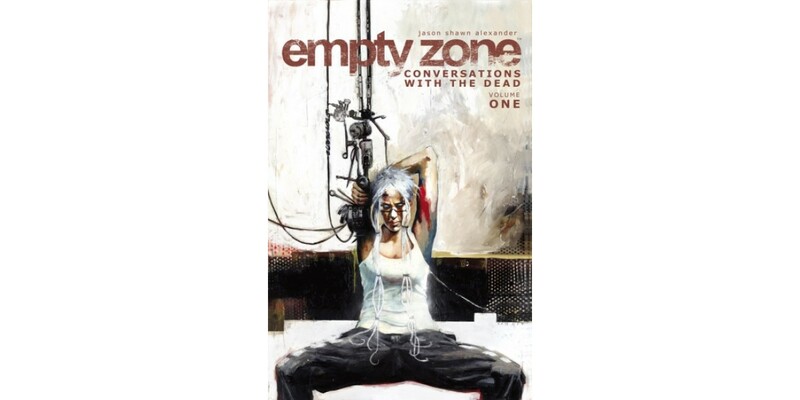 Eisner-award nominated artist Jason Shawn Alexander (Abe Sapien: The Drowning, The Escapists) weaves the unsettling, dystopian saga of Corinne White in THE EMPTY ZONE, VOL. 1: CONVERSATIONS WITH THE DEAD. This collects issues #1-5 into trade paperback and will be available in December. THE EMPTY ZONE, VOL. 1 introduces readers to a bleak future, eighty years after a worldwide blackout. The world is a much darker and scarier place. Corinne White is an ex-soldier turned black market spy, data courier, manic-depressive, alcoholic. Punishing herself for mistakes from her past, Corinne is brought out from her spiral when she’s contacted by her dead friends who inform her of a plot to reanimate the bodies of the dead by a psychotic billionaire. THE EMPTY ZONE follows Corinne as she confronts these undead monsters and comes to terms with her past. THE EMPTY ZONE, VOL. 1 (ISBN: 978-1-63215-548-1) hits comic book stores on Wednesday, December 16th and bookstores on Tuesday, December 29th, and will be available for $9.99. It can be ordered by retailers from Diamond Book Distributors with Diamond Code OCT150531. It can be pre-ordered now on Amazon, Barnes & Noble, and IndieBound.